Makes about : 15 - 20 biscottis. 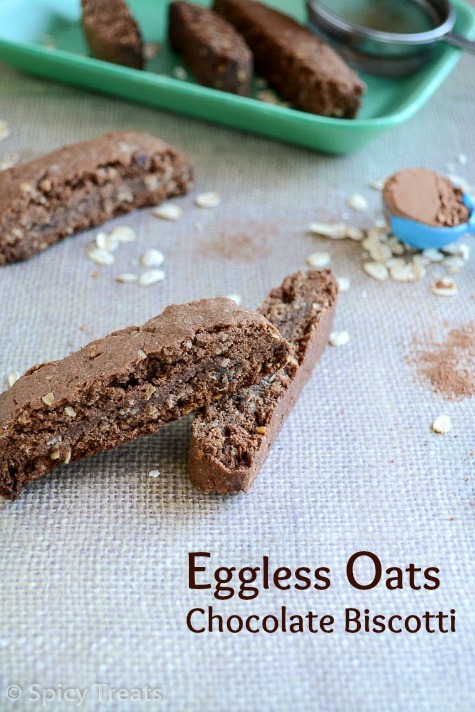 Take the flour,rolled oats,cocoa powder,baking soda,baking powder,salt in a bowl. Meanwhile whisk together the butter,sugar until they turn smooth. Add in the melted chocolate,vanilla extract and give a quick stir. Now slowly add in the dry ingredients and mix everything well, if its hard to knead add milk, if its sticky, add in few flour. Lastly add chocolate chips and knead to a soft dough. Roll the dough as a log and transfer it to a baking sheet lined over a baking tray. Bake the log for 20-25 minutes. Cool it for 10 minutes. With a sharp knife, slice it diagonally as 1 inch pieces or roughly to get around 15-20 pieces from the log. Bake it again for 5 minutes. Flip the biscottis and bake again for an another 5 minutes. 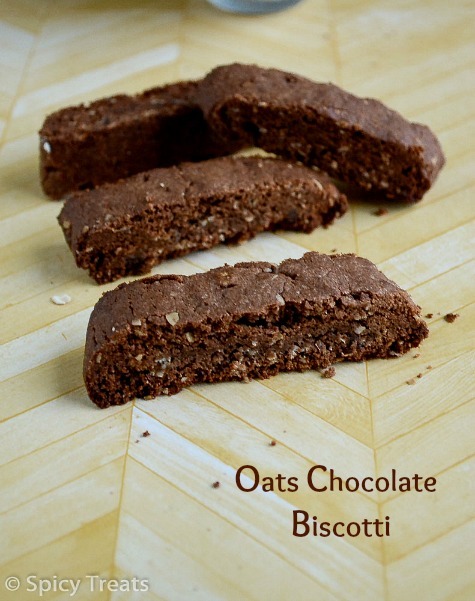 That's it..Delicious Oats Chocolate Biscotti ready. After cooling completely store in an air tight box. 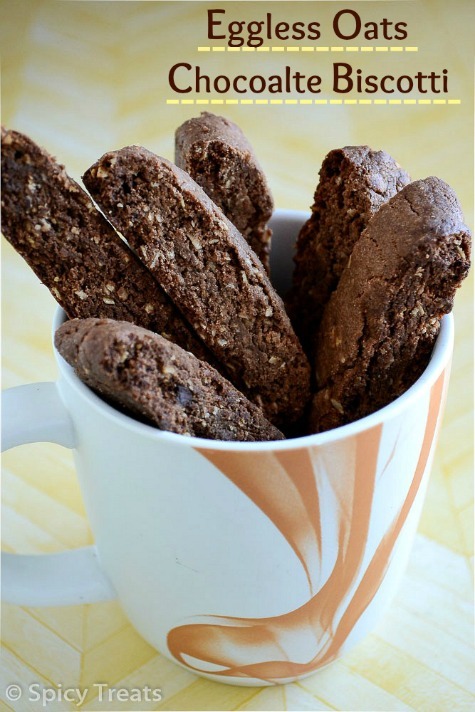 Linking this to Home Bakers' Challenge - Biscotti Challenge by Priya. and to Food On Friday : Recipes that kids will love @ Carole's Chatter. To Melt chocolate - Take chocolate squares in a microwave safe bowl, add 2 tsp milk and microwave in high for 40-45 seconds and use it in the recipe. This dough will be crumble type so add milk to make it a soft dough. Do not add more milk just for binding and try kneading the dough for few minutes. This will help to get a smooth and soft dough. Crispy and crunchy to look at biscottis. 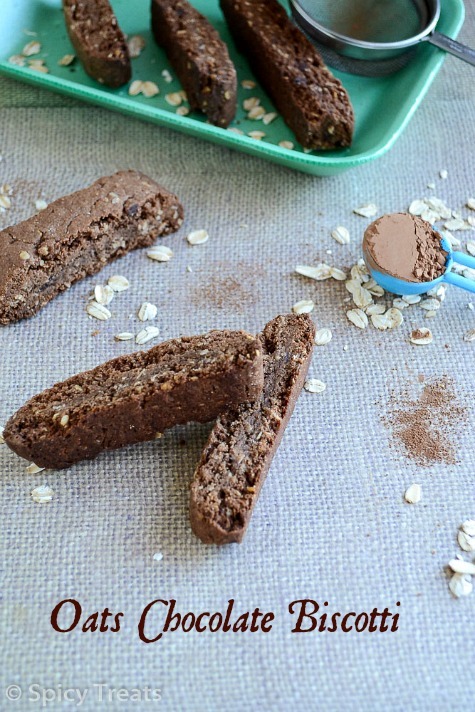 Chocolate biscotti looks superb. Nice presentation. 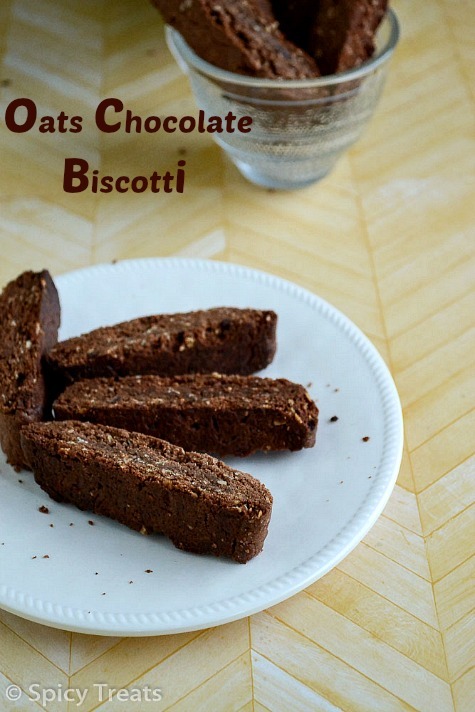 Beautifully made..never tried my hand at biscottis..should try sometime..
perfectly made sangee.. i didnt try chocolate biscotti.. but will give it a try..
Biscottis look awesome, with chocolate and oats too, and beautiful clicks Sangee..
yes.,i missed to add it in the Ingredients, now i added. You need 1/4 cup melted chocolate for this recipe. 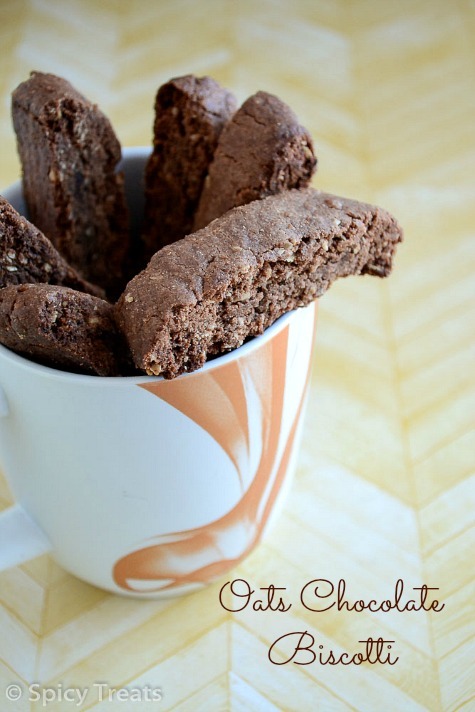 You can use any baking chocolate or dark chocolate or chocolate chips. Melt in microwave with 2 tsp milk and use it in the recipe. Hope this helps. Biscottis looks very prefect, you have nailed them just fabulously Sangee, thanks for ur kinds words, happy that kutties loved this biscottis very much..
Can i use wheat flour instead? My biscottis got burnt from the base..☹️ any remedies?